The Media Bloggers Association (MBA) has received considerable attention for gaining access for bloggers to the Libby trial. The fact is that journalists are busy people and some bloggers may not be aware of other blogger's online activities. Throughout the course of the day, I will be sending the letter posted below (or a variant thereof) to every news outlet that has discussed the MBA in the context of the Libby trial. I would encourage others to also share that information with groups discussing relevant topics. Feel free to use whatever portions of the letter you find to be of most relevance. 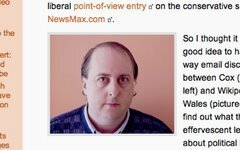 Are you aware that Bob Cox, founder and President of the Media Bloggers Association (MBA), is also widely recognized as running one of the most virulently right-wing presences on the internet – www.olbermannwatch.com? The raison d’etre of Cox’s blog is a critique of veteran news anchor Keith Olbermann. If you’re not familiar with MSNBC’s Countdown with Keith Olbermann, it’s been the only cable network program to openly express disagreement with the Bush administration’s policies, in particular on the war in Iraq. Bob Cox refers to supporters of Keith Olbermann as “Olbyloons” – a derisive term whose only purpose can be to evoke scorn and distain for those who support Olbermann’s informative, entertaining, and thought-provoking newscast. Given the importance of the Libby trial, this may help to put the MBA’s activities in this broader context. The blogging community has thrived on the principle of questioning accepted wisdom. In that same spirit, I would encourage you to reflect on the background of MBA’s spokesperson. Are you confident about the absence of a right-wing bias from MBA? Do you believe that the information that you are receiving from them is both fair and accurate? It is a watershed moment to have the Libby trial opened to live blogging coverage. It would be a tragedy to have that honor somehow compromised by demonstrable partisan affiliations among those pioneers.